I finished a UFO!! An honest to goodness, 2.5 year old UFO!! Woohoo! I’m very slowly cutting down on that pile. I’m trying to be good about not starting new projects without working on the old ones. It’s been tough but soooo satisfying to finish up those older projects once begun with such enthusiasm. I started this one a couple years back, inspired by the Old Red Barn Co. Quilt Along of Asterisk quilts at the time. I actually had a bee that I was in at that time help work on the blocks. I sent them the squares and tiny strips of various linens. I’ll be honest and say not every block I got back made it into the quilt. But that was over two years ago and I don’t even remember WHAT bee I had work on this let alone WHO it was. I had a set number of completed asterisk blocks when I pulled this UFO out and quickly decided I didn’t want to make any more. Instead, I used the blocks I had cut as an outer border for the quilt and did a smaller border with a Tula Pink print that was just the right navy. 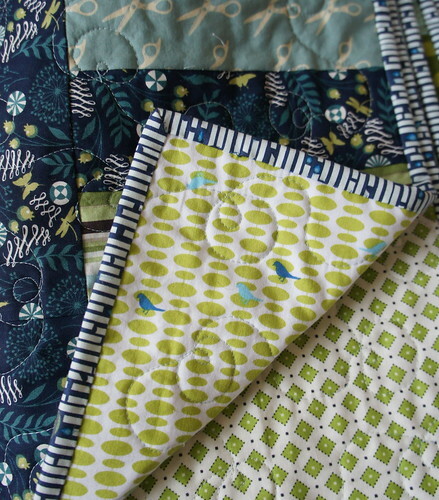 The finished size is a good lap size quilt. It’s been planned for a SIL for years now and though she has no idea, I’m glad I’ll finally be able to give her a quilt! A huge shout out to my friend Kelly who quilted this for me with her awesome Tiara machine on our recent weekend in Atlanta. ♥♥♥♥♥♥ She did this great free motion double loop that I need to figure out how to do. But she’s the real reason this is finished. LOVE YOU!!! Yay for finishing a UFO! It is lovely! I love the colours! This is very pretty! I really like the navy border, especially how you extended it out to the edges. And I agree that using up old fabric does cut down on any guilt from buying more, more, more! Gorgeous! And congrats for finishing a work in progress! I love the colours you used and the asterisk design is gorgeous. Your SiL will be delighted I'm sure! it's beautiful! i love the binding and all the colors go well together. Cute! 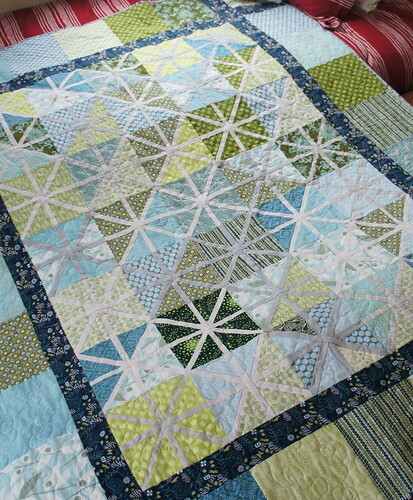 Yay for finishing a quilt! I love this! 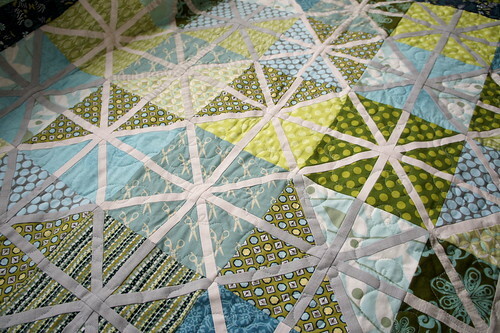 An asterisk quilt has been on my mind for a while. This might just be the impetus i need to get onto my own! I really love the "stripy" binding. It sets it off so well! Love this quilt. The colors really remind me of Saltwater's blue/ green color way. Good for you for finishing this! It's beautiful. I love the intricate detail of the thin white asterisk! Wonderful colors too. I am so glad that you finished this wonderful UFO!!! It is beautiful!!! Congratulations on shortening the UFO pile and getting closer to working on something new! It's a beautiful quilt. Congratulations on getting it done. 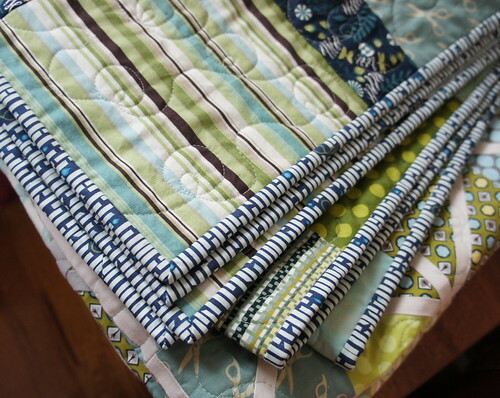 Congrats Angela, it is beautiful, I love how you can just put all these fabrics together and IT WORKS so well. They play together so nicely!!!! Congratulations. 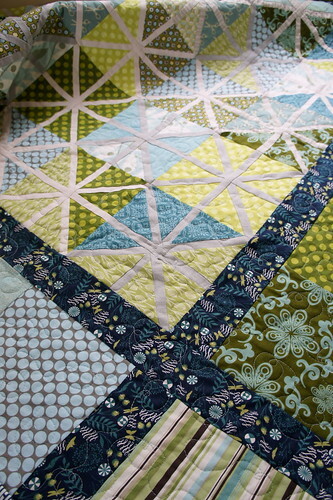 It looks great at the quilting is fab. Super Cute. Hooray for Finishes! Nice colors and congrats on finishing another UFO. Very nice! Love the binding!